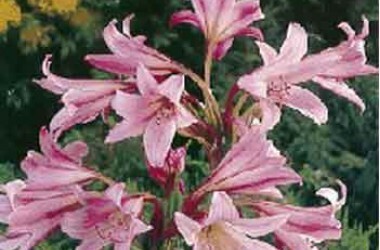 Received from the USDA as "Amaryllis belladona"--probably Z8 winter hardy. 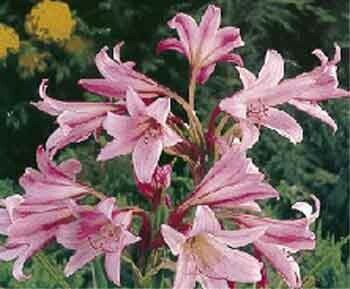 After the late fall and winter month's large distichous strap leaved foliage dies down in early summer; eventually mature bulbs produce solitary nodding rich pink waxy trumpet shaped flower clusters early fall. Not the common winter hardy Lycorus squamiferum, the "Naked Lady" of the midwest. This is the real McCoy--large bulbs are shipped bare root--plant them so that the surface is just barely showing at ground level.